After my ambitious triple-blog-post week just after Arlo was born, I lost the motivation to write. I even had a few recipes and photos uploaded to my drafts folder, but I just couldn’t write the actual posts. Knowing how fast this time goes by, I yearned to simply be present. I slowed down, which felt absolutely amazing. I worked when the inspiration was there and didn’t when it wasn’t. I soaked up our sweet baby boy. 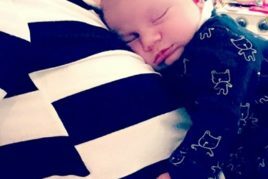 I savoured the confidence and ease of being a second-time mom (what a difference). A rollercoaster of hormones hit me early on, and I struggled with the blues on and off. I nursed and pumped and nursed some more. Eric and I mumbled incoherent words, back and forth, in the middle of the night (why is it so impossible to string words together at 3am?). I kissed Arlo’s head, cheeks, and feet a million and one times, and it has yet to feel like enough. I don’t think it ever will. We witnessed Adriana transform into a little girl right before our very eyes. One night as I rocked her at bedtime—with her long legs falling off the side of the rocker, my arms burning under the weight of her body, and her bossy words instructing me what songs to sing and not to sing (“NO thank you, MOMMY!”)—it struck me that I was not cradling a baby anymore. I fought back tears. It had been a while since I rocked her, as my 3rd trimester bump had gotten in the way. Now she was basically a teenager disguised as a two-year-old. Our basement renovation is almost wrapped up, so we’ve taken up dancing, the four of us, in the unfurnished rooms while listening to Christmas music. Adriana clutches her baby doll in her arms, just like I do with Arlo. We also play hide and seek. Often, the basement fun abruptly ends in tears as Adriana has a penchant for running into walls. Ouch. Boo-boos are kissed, and we explain, once again, why it’s a bit too soon for her to pick up her baby brother. So she hovers about an inch over his face, just trembling with excitement, sneaking in kisses. “He’s looking at you!” she yells with delight as he stares into her eyes. I never want to forget these moments. Even though I haven’t been writing as much, I’ve been cooking every chance that I get. A couple months ago, Pulse Canada contacted me about partnering with them to develop and share a recipe in celebration of the International Year of Pulses. If you can believe it, I’ve never created a sponsored recipe; most offers I’ve received didn’t feel like authentic reflections of me and the Oh She Glows brand. But pulses…well, I didn’t have to think twice. Peas, beans, lentils, and chickpeas? You know I’m down with that. As I’ve shared on the blog before, Canada is one of the world’s leading producers of pulses (in fact, we’re the #1 producer of peas and lentils, which I think is super cool). There are a whopping 22,000 pulse farmers in Canada (high fives), and our pulses are consumed in over 150 countries. (“Our pulses”? Okay, now I’m talking like I grew them myself or something!) On a personal level, I eat pulses every single day, and I adore their flavour and versatility. Red Lentil Hummus, Chickpea Pancakes, No Bake Chickpea Cookie Dough Bars (a recipe I never got around to finalizing! ), Lentil-Walnut Taco “meat”…the sky’s the limit with what you can create! Aside from being super nutritious and easy on the wallet, pulses are friendly to the environment, too. Their carbon footprint is lower than almost any other food group. A big thanks to Pulse Canada for sponsoring this post. I’m delighted to finally share my newest pulse-based stew recipe with you below! Be sure to check out my Instagram post on Friday for some super exciting Black Friday news (hint hint: big app sale, a free holiday cookie app bundle, and Android news!). Butternut squash, red lentils, and sweet potato are wrapped in a lightly sweet and creamy coconut and tomato broth accented with spicy notes of turmeric, cumin, chili powder, cayenne, and garlic. Apple cider vinegar provides a tangy brightness to bring everything together. This stew tastes better the next day once the flavours have had a chance to mingle; if you can make it the day before serving, I’d highly recommend it! This recipe was created for Pulse Canada, and was inspired by Deliciously Ella. To a large pot, add the oil, onion, and garlic. Stir to combine. Increase the heat to medium and sauté for 3 to 5 minutes, until the onion is softened. Add the squash and sweet potato and stir to combine. Add a pinch of salt and continue sautéing for a few minutes longer. Add the broth, diced tomatoes (with juices), coconut milk, lentils, tomato paste, turmeric, cumin, chili powder, cayenne, salt, and pepper. (If you are spice-shy, feel free to add half the amount to start and increase from there after cooking, to taste.) Stir well to combine. Increase heat and bring to a boil. Reduce the heat to medium, stir again, and simmer uncovered for about 30 minutes, stirring occasionally, until the squash and potato are fork-tender. Reduce the heat if necessary. Add the apple cider vinegar to taste. Adjust the other seasonings if desired. Optional step: Using a handheld immersion blender, blend the stew for only 2 to 3 seconds (any more and you’ll blend too much of the veggies). This thickens the broth. Stir in the chard, and cook for another couple minutes until the greens are wilted. Scoop some cooked rice onto the bottom of a bowl and then ladle the stew overtop. Garnish with minced cilantro or parsley and a good dusting of garlic and chili powder, if desired. Leftovers will keep in the fridge for up to 5 days, and they freeze beautifully too. Recipe makes 11 cups (2.75 quarts). ** You can swap the red lentils for 1 (14-ounce/398 mL) can chickpeas (drained and rinsed). *** You can swap the chard for 5 ounces of baby spinach or a bunch of kale (stemmed). I recommend chopping the greens into small bite-size pieces for easier eating. I don’t see how this is misleading. She never says this is in the cookbook. She simply references her cookbook in the post, she also mentions her baby in the post but I wouldn’t assume he comes in the cookbook simply because he’s mentioned in the post. I think it is in the most recent cookbook? Also, I made this last night and O-M-G did it cure what ails me: an accumlated 2.5′ of snow, wisdom teeth removal recovery and a post-2016 hangover. I used the lite coconut milk but added just the cream from a refrigerated can of full fat coconut milk to make it creamier; today I added coconut aminos and it was the BOMB! Very healing, satisfying and prepping everything first made clean up a snap! Thanks, Angela. This recipe looks fabulous. I can certainly relate here– I love my peas, chickpeas, beans, and lentils. I end up throwing together a big bowl of steamed squash, sweet potatoes, lentils, and rice at least a few times a week this time of year, so spinning it all into a soup is such a fun new variation that I’m excited to try. Congratulations on your first sponsored post! Great recipe, cannot wait to try. All the best for the finals, I have voted again! Thanks for your support, Bev! Thanks for your post and reminder to vote for your cookbook (I did :-).I’m glad to hear you’ve been slowing down a bit and valuing the moments before they become memories. I don’t eat lentils enough, though I love your Ultimate Green Taco Wraps. I need to try this one, too. Thank you for the vote, Heather! :) I appreciate the support so much. Mmmm. I know what I’m making next week – I even have all the ingredients! I’d love to vote, but the book is on my Christmas list so sadly I don’t have it yet. I can say that your first book is the most heavily used out of my extensive collection! I can’t wait for the second one. Enjoy the baby and the slowing down – we will be here when you show up! Could I use chickpeas instead of red lentils? Hi Jen, Yes, definitely! Please see my note at the bottom of the recipe for a chickpea tip. :) I hope you love the stew! Tried this recipe tonight. We loved it! I’m so happy you enjoyed it, Jo! So glad to see you’re back! I just wanted to share how much my family and I are enjoying Oh She Glows Every Day. I ordered it the moment it was available to pre-order, and these last few months have really gotten me inspired for cooking again, largely because everything we’ve tried in your book has been such a success (most recently used recipes: 9-spice mix, pumpkin snacking cookies, dusted w/ confectioner’s sugar, and cabbage lentil soup — all in the last few days). After a couple years of limited time and energy, my love for cooking was waning. Your blog and book are such a delight. Your book is my go-to lately for meal planning and inspiration. Best to you and your family! P.S. As an Android user, I’m hopeful that your app might be available soon too given your hint today! This was amazing tried it all went well. Loved the taste of the potato. Great dish, could not wait to attempt. All the most effective for the finals, I don’t eat lentils enough, though I enjoy your Ultimate Green Taco Wraps. I need to try this, as well. This is so my kind of thing! Omg, I adore sweet potatoes with curry! Yay, I’ve been eyeing this on Snapchat!! I’m all for pulses, so the theme is awesome! I read a book called “The History of Beans” which I highly recommend to anyone who likes pulses. Definitely voted, and definitely will be checking Insta tomorrow!! Thanks for the support, Ruth! What a gorgeous stew! I’m a lentil addict, so this will be working its way into weeknight repertoire sooner rather than later. Congrats on making it to the final round of the Goodreads Choice Awards. This looks so good. I love the addition of the chard. Congrats on the Goodreads nomination. Just voted – best wishes for your success! I’m going to make this recipe this weekend. Can I use squash that was store bought, still raw but nicely cubed which is now living in my freezer. Arlo – what a wee dote (an old I rish expression for someone you’d be doting on and how could you help not)? Hi Jane, thank you so much for your support! Also, I love that phrase “a wee dote” too; I’ll have to throw it into a convo with our Irish relatives sometime and see if I impress them! haha. ;) I don’t see why frozen squash wouldn’t work, but I have to admit, I’ve never added frozen squash to a soup before! If you try it out, please let us know how it goes. I DID try the soup with the frozen squash but it occurred to me that adding frozen raw squash to the recipe at the beginning could make it more watery. So I put everything but the squash together and started cooking. I defrosted and cooked the squash by steaming it and added to the rest of the stew by checking what stage the sweet potatoes had reached – when they matched, in went the squash to pick up the lovely flavours. Worked out a charm and have just finished a bowl of it for lunch – delicious! Thanks for getting me to think outside the box. As a mom of three, including one born the same week as Arlo, I’m glad you chose to slow down. Life is too fast and mental health is important too!!! Ive been a long time fan and love your cookbooks. My husband always teases me and says, is this recipe from your friend,Angela? 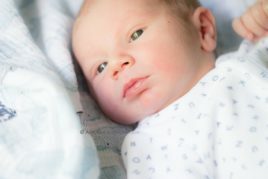 I just felt like writing today to encourage you as a new mom and fellow “friend” in the food world! I made this tonight and loved it! Even my husband had seconds and is taking it for lunch tomorrow! Thank you! That’s a great meal for a cold winter evenings :) love it! Angela congrats on new baby, and good for you slowing down and taking time to enjoy your little ones! This recipe looks wonderful. Do you think it would be as good with regular brown lentils. I wish you the best, and I’m going to vote! Hi Lisa, thank you so much for the warm congrats! 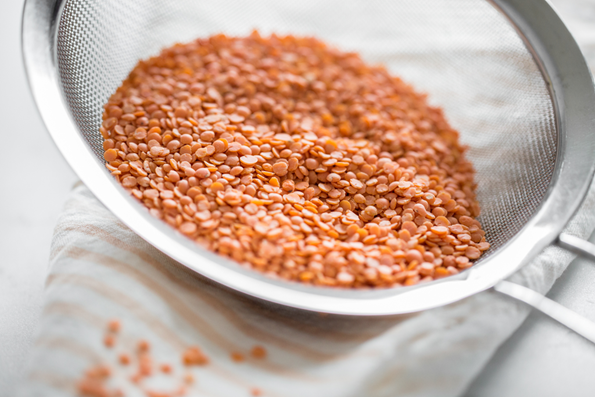 Red lentils are great in soups and stews because they break down when cooked, and help to thicken the broth. Brown lentils should work too though, but keep in mind they’ll retain their shape a bit more and alter the texture of the soup slightly. Please let me know what you think, if you give the swap a try! Sent a response yesterday – have both your cookbooks, can I use frozen squash and what a lovely baby Arlo is – my post isn’t included with others dated yesterday. Did I not send it correctly? I thought I hit the submit button but maybe not. Yay for stew and super YAY for the Android App. I cannot tell you how excited I am for the app. I totally feel I have been missing out. Like I knew about the party but was not invited. Love the video, the cookies look Delish! This stew is going in my belly this weekend. I just have to get my hands on the light coconut milk. Congrats on becoming a family of four. Made this for lunch today, my mom and I loved it ! Thank you for your amazing recipes! Thank you for the support, Camille! I’m so thrilled you and your mom enjoyed the stew. ALWAYS love to read your stories – you’re one of the greatest story tellers today. Looking forward to the pulse pledge. Happy eating! I just got your new cookbook from the library. Had to wait a bit for it as it is so popular! I love the sound of this recipe and am going to try it, but I have to comment on the pictures in your book (and the last book too) They are so amazing and yummy looking, you just want to try everything. I am also impressed with the glass canning jars and other containers, bowls, glasses that you use, but especially the canning jars. I like the way they can stack (mason jars don’t always stack so well. May I ask where you got them? you should put that information in with your bibliography the way some magazines do. I got a set of dishes that I just loved that way from Eaton’s (going back awhile) because I saw them being used in a food presentation in a magazine. I believe it was Chatelaine! I love those “stackable” canning jars, too! I searched, found and purchased them at Crate and Barrel, they are called Weck jars if you are loving the same ones I am! That looks too good to be true! ?? Can’t wait to try this! Because I’m lazy, do you think I could throw this in the crockpot? This looks great and the cilantro looks like a great flavor contrast to the sweetness of the squash and sweet potato. Yummy spice blend too! Hi there! I’m so pleased to hear you’re interested in receiving our newsletter. 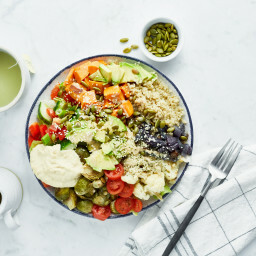 You can sign up here: http://ohsheglows.com/newsletter/. Made this recipe tonight as an after hike meal. The company I was with did not want to have any onion or garlic in the recipe so I gave it a try without those items and this recipe turned out wonderfully! Very creamy mouth feel and very satisfying over a bowl of brown rice. Very nicely done Angela. Another incredible recipe! I made this for dinner tonight and it was delicious! Thank you for another great recipe! I have both of your cookbooks and I love them both. Oh, I voted! I’ll try and vote again tomorrow! Thanks so much for the support, Sue! I’m so happy you’re loving the cookbooks (and this stew!). I can say whole heatedly that you need to follow the tip of cutting the squash into almond sized pieces. I forgot to do that and had to cook it a lot longer and keeps testing it to see if it was done. Also, I’m amazed at how you could have been writing my very own story…my sweet boy was born October 24th and we are also trying to soak it in! The minute we came home from the hospital we realized our little girl was not so little anymore. She is 2 years 5 months and bossy too?. I seriously ugly cried a few times realizing how big she is and even though ADORING our sweet boy, missing all the sweet days I had with my sweet girl. I too had baby blues for a couple weeks so that didn’t help. Big sister loves brother and we love that! I’m just trying to survive as a mom so I can’t imagine how tired you must be! Hope you are doing well! Hey Courtney, Congrats on your new baby boy! Yes, it’s all about survival right now..glad we’re not the only ones! ;) As for leaving out the soup you definitely can try it. I would probably add a bit more broth in its place. The tomatoes lend acidity to the soup so you might find that it needs a little “brightness” added back to it without them (such as more vinegar until it pops). Just add it slowly to taste and you should be fine! Or maybe you’ll enjoy the flavour without tweaking anything at all. I made this on the weekend and it was fabulous. This looks so hearty and delicious! I’m so glad that you took the time to slow down and experience the special moments in your life. So precious! Can I roast the sweet potatoe and butternut squash cubes and then add them to stew? Oh, I think that would add a really lovely smoky flavour to the soup. Let me know how it goes if you try it out! Welcome back! We are glad to see you! I am going to try this recipe on Thursday when I work from home. Now I’m at the office enjoying one of your lentil soups from the second cookbook. What is my afternoon snack, you ask? Why, it will be the chocolate chip cookie dough balls from the first cookbook. Livin’ La Vida Oh She Glows Life! This recipe is amazing! My whole family loved it, even the toddlers. Loving your new book – voting now! Good luck! I just made this yesterday and it was sooooo good! Everyone loved it…kids included! My family and I tried this last night… sooo good, my two year old actually asked for seconds :) Thanks for the awesome recipe!! I love love love your blog and I have been following it for years (especially during your pregnancy with Adriana, as I was just a couple of weeks behind you), but I have never once made anything. It all looks amazing and I have definitely been inspired, I am just not much for following recipes. But, my toddler and I are in a food rut and this recipe called out to me. I bought every ingredient (even though I never do that…I usually think, “eh…those five ingredients I don’t have can’t be that important”) and followed your instructions exactly. It was amazing. I probably won’t eat anything else until the whole batch is gone. I can’t wait to try more! Congratulations on your little beauty, Arlo. Just cooked this for dinner! Everyone absolutely loved it. The chard and apple cider vinegar was just amazing in there. When the three year old and six year old down it fast you know it’s a winner!! It makes my heart happy to see it there. We have both your book and your app, and your recipes are among our favourites. I have never seen a recipe mix ingrediens like this. Amazing! Im in love, thanks! This was so delicious – I can’t wait to make it again! I replaced the sweet potato with a potato because I had no more sweet potaotes left and it was still sooo delicious! Happy to hear you enjoyed the swap, Verena! This is delicious. Made it for dinner tonight on a damp New England night. Used garlic, onion, sweet potato, butternut squash and chard from my CSA share. I opted for the chickpea variation and didn’t make the rice. This will be a regular in my home. I made this tonight. So easy and so good! Hey Cindy, You could definitely swap the lentils for chickpeas (see bottom of the recipe for tips on that!) or use a combo of the two. Go wild! :) Soups are so forgiving. The recipe as written makes 11 cups, so I would say it serves 5 (I usually allot 2 cups per bowl). Great tip about adding a little less liquid. I like things more stew-y than broth-y so I will follow that suggestion! You just saved my dinner! I am 38+ weeks pregnant and having a weird afternoon. I was going to order out but decided to check your website. Thank you! It was amazing. My children loved it. Not too hot and not too spicy. Your recipes that we have tried have all been a hit! I made this tonight and it was absolutely delicious! I decided on spinach instead of chard, because I had a box of chopped, frozen spinach in the freezer, and chard is selling for $3/bunch even just at the big box grocery stores here. Although I found it adequately stew-like as it was, I did blitz it for a few seconds to get it thicker. This is a very south Indian vegeterian recipe. Meaning that lentils are regularly mixed with greens and veggies in south Indian cuisine for the daily dose of protein. Great Recipe!! I won’t lie. I forgot I did not have turmeric or cayenne but it was STILL delicious! I made ground turkey on the side for my husband and he loved it as well. I used spinach and it worked perfectly! Absolutely beyond delicious. With rice, even my husband loved it. And leftovers are even more amazing. Next day it thickens up to a glorious eating experience. Well done! Great flavor! Seems as though two cups of broth would have been enough though. It’s a bit watery. Hey Angela! Just wondering if it would be okay to leave out the coconut milk? I’m not a fan of coconut anything. Could it be substituted for something else? Loving these warm fall recipes! This is incredible! Thank you so much for the recipe. It’s a cold, rainy day here, and this stew hit the spot! I just realized that I omitted the tomato paste by accident, but it still turned out great. And, best of all, my usually skeptical boys tasted it and even asked for seconds! Thank you for another great recipe. I loved this recipe. I used my immersion blender as you suggested and it gave it a great consistency. Can’t wait for leftovers! I love my lentils and crazy for spices. this stew loaded with veggies is sure calling my name. Thanks for sharing this recipe. Can’t wait to try this and of course your book too! Making this right now. Flavors are lovely but just 1/2 cup of lentils? I know they’ll bulk up when they cook but it still doesn’t seem like enough. Just read your recipe and it is awesome. I could not wait to taste. I always love to read yours stories. I will prepare this tonight. Whereas it is not more heavy dish so basically me, my family any other persons mostly favor your recipe. Thanks for your sharing recipe and always share your recipe with people. I hope you enjoy it, Frank! Hi, I made this for dinner last night. DELICIOUS! Thanks so much for the recipe. Hi there Leah, I’m glad you enjoyed the stew! This is such a beautiful recipe. I have been following your blog page for many years. I read your recipe lest week and I wanted to surprise to my sweet baby who is now 14 years old. His birthday was on 7th December. So basically I cooked for him and also my family. So I can’t believe me that they are really tell me that it is awesome. So that time and now I am sooooo happy and I want to thank you for sharing this recipe. This stew seems so very comforting and flavourful, I love it ! Can these be made in a crockpot? Hi Kimberly, Yes, I tested this recently, and the stew works great in the crockpot! I just threw everything in except the greens, and cooked it on high, covered, for 4 hours, followed by 1.5 hours on high uncovered. Then, I used the immersion blender very briefly to thicken it into a stew texture, and added the greens at the very end. Great! Thank you so much! Definitely going to try it. I love using my crockpot in these cold months. Just tried this for dinner this weekend and it was delicious!! Thanks for the recipe, Angela! My 20 month old ate it. 5 stars. This time of year brings out some of the most lovely veggies. What a great way to mix the season together. I enjoy this even in warm Miami. Thank you for sharing! Best of luck. This looks so good. I think I’ll make it tomorrow for dinner. We are having guests over so this will be perfect. How would you go about making this in the crockpot? What a delicious, satisfying meal this made (plus a snack, plus standing at the fridge inhaling it cold.) I found the level of spice perfect for my family. My 2-year old asked for seconds, even! I will be making this again soon. So glad to hear you liked it, Catherine! Hi, Angela! This recipe is honestly incredible! I have never commented before but have been following you for the longest time. Your recipes have been such a life saver for me because of several food intolerances plus my family love them too! I stumbled on this recipe trying to find a last minute dinner idea with ingredients we already had on hand. What a gold mine of a find! Absolutely delicious. We made a large pot full and ate off of it for days and were heartbroken when the pot was empty ;) This was delicious, hearty, tasty, and un-complicated. Thank you for sharing! Just made this tonight! My husband and I love it! Definitely will be in our list of favorites! This recipe was mind-blowingly good! I’m trying to return to veganism after a long time away, and recipes like these fill my need for meaty, hearty winter dishes. Thank you so much for all that you do! Aw, thanks so much for the kind words, Emilie! I’m thrilled you enjoyed the recipe. If you try another of mine, I hope you love it just as much! I tried this tonight and both my husband and I loved it. It’s a new favourite and we’ll be making it again. It’s very flavourful and savoury, perfect for a cold night! We used baby kale and spinach. I did find that the prep took longer than expected, though. Wow! Made this tonight. It’s fantastic! We are not vegan but making an effort to trend toward vegan. I’m constantly impressed by your recipes and looking forward to trying all of the ones on your newest app I downloaded. How can I adapt this for a slow cooker? Hi Staci, I tested this recently, and I just threw everything in except the greens and cooked it on high, covered, for 4 hours, followed by 1.5 hours on high UNcovered. Then, I used the immersion blender very briefly to thicken it into a stew texture, and added the greens at the very end. Hope this helps! I made this a few weeks back and it was delicious. It made a lot so I froze it. I am serving the rest tonight. It froze beautifully and will be perfect for this chilly night. I’m glad you’ve enjoyed the stew, Kristen. Hope it helps keep you warm! This stew is AMAZING. If anyone is wondering about using a slow cooker, I threw everything into the crock pot and let it cook on high for 3-3.5 hours and it came out beautifully. I could not get over how delicious it was; definitely my new favorite cold-weather recipe. Loved this recipe — have made it twice now. Interesting taste note: I prefer to have only 1 tablespoon of apple cider vinegar instead of 2 or 3 — I like the sweeter taste. This recipe looks delicious! Can you use green lentils instead of red? Hi Brooke, Yes, you can! Just keep in mind that green lentils will retain their shape a bit more than the red lentils, which break down when cooked and help to thicken the broth a little, so the texture of the soup will be altered slightly. Please let me know what you think, if you give the swap a try! This looks absolutely delicious and I think I even have almost all of the ingredients needed to make this! My family is currently staying with me for a visit so I am seriously considering making this for dinner this week! Hi Pauline, I’m glad you and husband enjoyed the stew! That was one of the best recipes I have ever made for my family. Yum, yum, yum! I am writing this review while eating this stew and oh it’s soo good on a cold chilly day… I added red curry paste, soy sauce, lemon juice and curry powder. I also used spinach instead of chard. Thank you! Made this a couple of nights ago and we loved it!! Only thing I changed is I used half the cumin as my husband and I aren’t big on cumin. I wasn’t sure what to expect but everything I’ve tried of yours so far has been a hit so I gave it a go, glad we did! And you’re right, its even better the next day as the flavors melded together. Thank you for all the time and effort you put into your work, it is very much appreciated!! I am making now. It’s all in the pot simmering. It smells absolutely fantastic! If I could make one suggestion, it would be to revise the list of ingredients so that you include the size of the butternut squash and sweet potato pieces right in the list, rather than below the recipe instructions. I missed it and I did my best to go back and re-chop things, but I know it’s not all almond size shaped. Thanks! I love this! Made it last week and froze half… looking forward to those leftovers for my work lunches this week! This recipe is so unique in flavor, and it’s addicting! And I’m so glad to see the crockpot directions! That will make a perfect cozy lunch to come home to after church. Thanks for this Angela. I’m a huge fan of your blog and books. Happy New Year! I love stews this time of the year and this one looks and sounds so delicious! Love all the spices you’ve used. I’m eating this now and it’s amazing. Mmmmmm! I made this over the holidays for my half vegan and half non vegan family and it was a big hit! The flavors are spot on and it definitely hit the spot on a cold winter night. This will be in my family’s rotation from now on. Aside from subbing the chard for kale, I followed the recipe exactly and it was simple and easy to prepare. Winner! Made this last night – it was absolutely divine and perfect for a rainy winter evening. I’m glad this stew hit the spot, Mazzy! Hope you stay dry and warm out there. I made this last night and it is going in my “keeper” folder. Really delicious. I only made two changes. First, I added ½ tsp. curry powder, just because my family likes curry. Second, I changed a couple of steps in the recipe– I added the spices to the onions after they were soft and let them “bloom” while continually stirring. Then I added the tomato paste, stirring briefly before before adding the squash and potatoes. This helped the tomato paste develop a deeper and less-raw flavor. I do these steps every time I make a dish like this and it always helps to bring a richness and depth to the food. I made this last night and it was a hit with the whole family (including my kids of 3 & 1). I followed the recipe exactly but left out the chili powder to avoid it being too spicy for the kids. It was still delicious for all and perfect for the freezing weather we have here at the moment. Thanks again for another delicious recipe & happy new year! Hi! Thank you so much for all your recipes–I’m a big fan! I received your newest cookbook for Christmas and continually suggest your recipes to vegan and non-vegans! Yesterday I made your muffin tops from new cookbook-so quick and easy! I also made your banana protein granola bars which I freeze for on the go breakfast–one of my faves! Quick question for this one- I have seen in comments where you suggest cooking in Crock Pot on high for around 4 hours then uncovered for additional time. The other day I saw on Instagram stories you did double batch overnight on low for 12 hours. Do you prefer one method over other? Does either have a better taste? Also this may be silly question but should I saute onion and garlic before putting in crock pot? Thanks for your help! Hey Heather, Oh, great questions! And not silly at all (I have often wondered this in the past too). I don’t know if I have noticed a big difference when cooking on high for a shorter amount of time versus overnight on low. I would think that the flavours might develop a little more overnight, but I haven’t really paid much attention to it as I’ve only done it a couple times so far. I don’t sauté the onion and garlic beforehand to try and streamline things (I just throw it all in! ), but you definitely can if you prefer. I also noticed that when slow cooking this stew, the chard flavour was more pronounced for some reason, so I think next time I will try using spinach and maybe adding it just before serving. Hope this helps! It came out a little more like soup instead of stew. I used the immersion blender but I’mnot sure where I went wrong. Still delicious! This recipe was delicious! It reminded my husband and I of butter chicken. Made this on the weekend. Delicious. Glad to hear you liked it, Kelly!! Hi Sharon, thanks so much for taking the time to comment! I’m so happy the soup was a hit. My whole family loved this recipe – even my husband who tends to find butternut + sweet potatoes a little too sweet and cloying for his taste. The way the red lentils and coconut milk combine to thicken the stew is genius. I used a potato masher instead of my immersion blender to smash up the ingredients a bit, I find that makes it easier to not over-purée. Topped it off with a dollop of plain Greek yoghurt. YUM!!! It’s so great to hear the stew was a hit with everyone, Jennifer! Using a masher is such a great idea, too. Absolutely Delicious! I was a little sceptical, but made it for dinner, as I wanted to try a plant based meal. Everyone loved it! This recipe is a keeper! Can’t wait to try more recipes from the cookbook! Oh, I’m so happy to hear this stew won you over, Nancy! I hope you love whatever recipe you try next just as much. So this is the first recipe I have ever tried and although I have experimented w/one vegan recipe from another source – I don’t recall it as enjoyable. Well this one is definitely where I should have come. Fed this to me, my husband and my daughter… this recipe is unbelievably good. Only change I made was to add the heat to taste… thank you for advising that. So good! Hey, I’m a big fan of your books, blog and app. Made this tonight. It was amazing and had a perfect little kick to it. Thanks for posting!! Can’t wait to freeze some and have it in a few weeks as well!! Insanely delicious. Don’t hesitate. Just make it. And then make it again. This looks delicious and I can’t wait to make it! Based on your recent Snapchats, it looks like you use your slow cooker to make this as well? What are the instructions for making this stew in the slow cooker? Hi Whitney, I just threw everything into the slow cooker except the greens and cooked it covered on high for 4 hours, followed by 1.5 hours on high UNcovered. Then, I very briefly used the immersion blender to thicken it into a stew texture, and added the greens at the very end. Hope this helps! Made this last night and it was delicious! I roasted the butternut squash first just for fun and it was great. Thank you for the recipe! So glad you enjoyed it, Talya! I stumbled on this recipe and looks great except of the Coconut milk, nowadays healthy cooking has a lot of Coconut/coconut milk product in it. I am highly allergic, what would be a good substitute? I have been using almond milk. Hi Janet, I haven’t tested any swaps for the coconut milk yet, but you can definitely try almond milk. I think cashew milk might lend a nice creaminess too. I’m sure it goes without saying but be sure to use unflavoured (no vanilla) and unsweetened milk. Another thing you could try is using half almond milk and half cashew cream (blend soaked cashews with water until smooth). Please let us know if you try anything out! I made this for a family potluck. It was a huge hit! I had 3-4 people ask for the recipe (so I directed them here!). I’ve made it a few times since too. It is delicious, nutritious, and pretty easy to make. My boys (3 and 1) liked it (even the time I forgot to cut back the heat for them). What FABULOUS stew – it was positively delicious and so warming on a dark and dreary winter’s day. I made one change – I substituted Penzey’s “Now Curry” spice blend as it had all of the spices listed in the recipe, plus my favorite fenugreek and cardamom. It was a big hit – even for the non-vegans in my family! Definitely going into my recipe rotation. What a great idea, Tonya! I’m so glad the recipe was such a hit with everyone. Keep warm out there! Made it tonight – so delicious and easy! Perfect for a chilly NYC evening. We had it with brown rice on the side and cilantro on top. Can’t wait to eat the leftovers – I’m sure this will get even more delicious the next day. Thanks for the great recipe! This is a fantastic recipe! I swapped the lentils for canned chickpeas in the last ~10 mins of cooking and used baby spinach because that’s what I had. Served over white rice. A perfect, nourishing meal that I will be making again. I made this recipe without any of the tomato products. Best soup ever! Yummy recipe! I used my Instapot pressure cooker; it worked great. Hate to admit this on your website…but I am a meat eater. I have followed this website over the years and incorporated some of the recipes to spice it up and add meatless options to my diet. I made this recipe over the weekend because I happened to have all the ingredients on hand and it was delicious and incredibly satisfying. Just what I needed on a cold January day. Absolutely delicious- thanks for the recipe. This was so tasty and quick to make. I had a good friend over last night who loved it and filled up her Pyrex for lunch today. This was my first recipe from your blog (I am new to vegan cooking) and I can’t wait to try more this weekend and share this with my friends and family. Thank you!!! I was cooking up a storm tonight and only just realized that I was making 2 of your recipes simultaneously without realizing! Your chana masala is my go-to work fuel lunch, and I’m loving this soup for snowy days. I’m a meat & dairy eater but it’s so nice to find yummy vegan recipes to supplement my diet. Thanks! I found your recipe on www.soulemama.com. I am trying your recipe tonight! So excited! Mind if I ask what kind of wooden soup bowls you are using? They are beautiful! Thank you Gina! The bowls were purchased second hand, so I’m sorry I don’t know where they were from originally. I hope you enjoy the soup! This was delicious. Both my husband and I loved it. The only changes I made was to add minced ginger in with the garlic, used chicken broth because that’s what I had on hand and used Mae Ploy Yellow Curry Paste for a Thai/Indian fusion. This is now my favorite curry! Just made this last night and it came out amazing! Very easy and delicious soup recipe. We LOVED this recipe. I left out the diced tomatoes and the chili powder because i didn’t have any, and it was still amazing. A great winter comfort food dish! This recipe is so delicious and ignited my obsession with turmeric! After making this stew 3 times in a month, I really wanted to share the recipe with others, so I recently blogged about it on A Healthier Upstate (https://www.ahealthierupstate.org/hidden-gems/hidden-gems-turmeric/) – a health and wellness blog for the upstate New York community. I wanted to thank you for inspiring this story! Thanks so much for your kind words and lovely post, Erika! :) I’m so thrilled you loved the soup. Try this recipe it is super good and the meal was just perfect like the author said it would be!!! Awesome recipe. Super easy to follow and tastes fantastic. Froze half the batch which tasted just as good if not better when reheated! Awesome! So glad it was a hit, Kelly. Wooowww….. this was about THE most delicious dish I’ve had in a ling time!!!! Thank you SO much for this great recipe! Just tried this for the first time today! LOVE it!!! So happy to hear it, Kirsten! I made this recipe last night and it is absolutely fantastic. I have a binder in my kitchen in which only the best recipes (the ones that make you scrape the plate or bowl for every last bit) are stored. This recipe made the cut. It will be one I look forward to making again and again. Thanks! I received you wonderful cookbook as a Christmas present from my Mom and I have to say I am enjoying it immensely! I am not a confident cook and have truly loved creating your recipes AND my kids eat it up! Thank you for creating such a beautiful piece. This recipe looks like another winner for my household! I have a question. I made the Comforting red lentil and chickpea curry last week but found it to be dry. Is the fix to add more puréed tomatoes? Hey Lisa, I’m so happy you and your family have been enjoying the new cookbook! That’s always so wonderful to hear. :) If you find yourself wanting a bit more moisture in your Comforting Red Lentil and Chickpea Curry, I think adding a bit more of the tomatoes is a great solution. This recipe is supposed to turn out thick and stew-like, but thinner consistencies can be lovely too! Depending on whether you use crushed or pureed tomatoes, the moisture can be a bit different for each. So you might want to try both. At the very end of cooking just add a bit more tomato at a time and adjust until your curry is the desired texture. First, I’d like to mention that I LOVE your recipes. Thank you – they’ve really changed my outlook on both cooking and baking (and yes – I needed help :) Do you have a recipe for a first birthday cake? My son is turning one in a couple of weeks and I’m in need of a recipe for his cake. He hasn’t really had any sweet treats yet besides fruit, so would like him to try a cake which is delicious, with a hint ‘o healthy too! Any ideas? Hi Raffaela, Thank you so much for the warm words, and happy birthday to your little one! I’m sorry that I haven’t shared a healthy cake option for you little one. I will definitely keep this in mind for a future recipe though! I’ve made this recipe a few times now and just love it. It’s tasty and is the perfect comfort food. actually I made this and didn’t like it at all, or my guests, it says to cook it 30 minutes or until tender – it never got tender in 50 minutes, so served it anyway, then thought, ok, maybe I just need to cook it more, so cooked an hour the next morning and blah, still not good, I had to throw it out. sorry, just one girls experience. Hi Julie, How strange! I’m so sorry to hear that. Was it the butternut squash that never got tender? It sounds like it might’ve been a bad/dry squash if that was the case. Is there a reason why you don’t toast the spices first, like in traditional indian cooking? Isn’t that what releases all the flavours? Hi Amber, You can certainly add them sooner if you prefer. My dish isn’t meant to be traditional, and I opted to simplify my recipe as much as possible. “When should I be adding spices to a dish? Hi :-) This look and sound super delicious! Is it possible to sub the coconut milk for another type of plantmilk? like soymilk, or almond? Ps. thank you for all your amazing recipes! Hey Linea, I haven’t tested any swaps for the coconut milk myself, but you could definitely try almond or soy milk. I think cashew milk might lend a nice creaminess, too. Just be sure to use unflavoured (no vanilla) and unsweetened milk. :) You could also try using half almond milk and half cashew cream (blend soaked cashews with water until smooth). If you try anything out, please report back and let us know how you like it! Made this tonight. It was amazing!!! In love! Thank you! This has been one of my favorite meals to make this fall/winter! It has great flavor and never disappoints. Tonight I was debating on even making it because I didn’t have all of the ingredients and I’m so glad I decided to stick with my plan because it turned out great! I didn’t have onion, garlic, sweet potato, or diced tomatoes! So instead I used butternut squash, carrots and used 3/4 cup lentils rather than 1/2 just to use up my bag. I kept all the other ingredient measurements the same – AMAZING!!!! Not only is this recipe delicious – it’s also versatile!! Thanks for another wonderful meal Angela!! Angela, I just made this last night and oh my goodness! The flavors are heavenly! I absolutely love the combination of butternut squash and red lentils, but the coconut milk gives it this perfect, rich and creamy texture. Thanks for sharing this recipe! It’ll definitely make a reappearance in my household! I’m making this for a passover celebration tomorrow. We were invited to someone else’s house for the celebration. How do you think this would travel? My thought is to make it up until the chard step, then ask to use the stove at their house and add the chard at the last minute. My concern is that the green would lose it’s color en route. Is this an unnecessary extra step, or do you think it would be worth it? I just want it to look as pretty as possible, since it’s a potluck. Hey Julia, I think that’s a great idea. I find sometimes if the chard sits too long, it can get a strange chard-y flavour (or maybe that was just a weird batch I had last time, lol), so adding it fresh might be a nice option. Or you could use kale or baby spinach instead, and add it in advance. I hope this helps! Oh My Gosh….this one is a winner, I’m cradling your new book, Oh She Glows Every Day….I love the ease of this recipe and the F L A V O R. I’m not joking, I’m bringing this to an Easter dinner invite, this weekend. Your recipe sounds delicious. I am not able to eat tomatoes or tomato paste. Do you have any suggestions for substitutions or modification of the recipe? Love this recipe – just wondering, would there be an alternate to using coconut milk? Thank you! Hi Alyssa, I haven’t tested any swaps for the coconut milk yet, but I think you could try almond milk or cashew milk (which might lend a nice creaminess, too). Just be sure to use unflavoured and unsweetened milk. Another thing you could try is using half almond milk and half cashew cream (blend soaked cashews with water until smooth). Please let us know if you try anything out! I made this recipe this evening after a long – and crummy! – day because I was craving some comfort food. It is SO delicious. I ended up substituting the lentils for chickpeas and was missing some spices (I hadn’t planned on cooking at all – part of my crummy day) so I used some of your 10-spice mix I had in my cupboard and it turned out so well! I’m already obsessed. Thank you for such an incredible recipe that absolutely turned my day around! Will definitely be making it again. 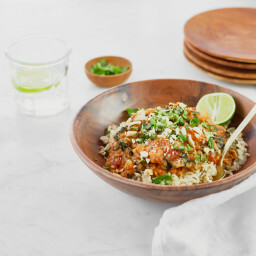 This was one of the best tasting lentil recipes I have ever had. Switched up the greens a bit and put it over quinoa ~ absolutely delicious and will be in rotation. DELISH! I have to try this recipe as it looks and sounds absolutely delicious. Thank you! I had a friend coming over who only eats vegan… (aghhh what to cook). This recipe popped up. Gave it a go and blitz it. Really easy to make and she was raving!! Paired it with an argentian red and it was devine. Im still full from it nearly 6 hours later. I must for anyone who isn’t at the master chef stage yet. Best of all I had 6 portions left over after I went back for seconds…. Thanks heaps for publishing this recipe. Aw, I’m really glad to hear your friend enjoyed it Katie! Um…YES! It’s spring, but it’s been rainy and cold this past week. So I felt like making a dinner that would warm us up from the inside out. This was delicious. Perfect balance of sweet, spicy, tangy, and creamy. And such a great idea to serve it over rice. It makes the presentation look nice too. Thank you so much for this! Hey Peter, So happy you came across my blog! You can definitely try adding the turmeric earlier if you’d like. Let me know if you notice any difference! excellent! will make it again and again. Made this over the weekend. Wow…it’s absolutely delicious. Great kick from the spices (not too little/too much). Instead of chard, I used spinach and I couldn’t find any red lentils at my store so I used other lentils. The only thing I may do different next time is to add a little bit of pureed dates to give it a bit of sweetness and maybe some tofu. I take this, along with some rice, to work for a wholesome lunch. So so so tasty. The whole family love it, even my fussy 3 year old. I made this today and it was the first recipe I tried from here. It was absolutely delicious and I got a lot of compliments on this! I replaced the butternut with carrots and the chard with spinach. I can’t wait to try more recipes! Delicious! Didn’t have butternut squash, so added fresh cooked spaghetti squash and almond milk instead of coconut. Served it over black rice. This dish is a winner! 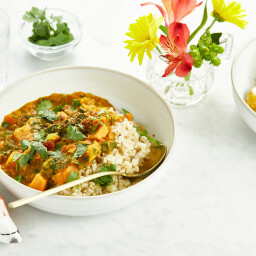 I’ve tried about half a dozen different vegan sweet potato curry recipes and this one is hands down the best! I used two sweet potatoes and no squash. I did use a curry spice blend because I didn’t have tumeric but the flavor was amazing with the other ingredients. Thanks so much! This was totally amazing – so delicious!! And that was with forgetting to put in the spinach which I was going to use instead of the chard, as I had some in the fridge. Both hubby and I were truly impressed. We want to start eating less meat and as I am sensitive to dairy, soy and eggs, this was perfect. Cooked tonight for the young vegans in my life. Delicious! Love the heat, the comfort and the healthy one pot meal. I finally earned my kids’ esteem for cooking! I’m so happy to hear the dish was a success, Sheila! Never tried Red Lentil Stew earlier. Appears like a perfect combination with butternut and sweet potato. I shall definitely try this recipe this weekend with my daughter and let you know my genuine feedback. Do you mind sharing any new tip on using pomegranate in salads, Angela? Hey Anna, I hope you enjoy the stew! As for pomegranate, I find it pairs lovely with festive, holiday type salads. There’s one in my first cookbook I believe. Happy cooking! This recipe is DELICIOUS! I have been eating the leftovers for days, I can’t get enough! Just made this for the first time. I can’t stay away from it. It’s fantastic!! Made this today and I can honestly say it is one of my newest favorite dishes. It is perfect in taste and texture. I added a tsp of curry paste just for extra taste. Oh my goodness. This is the third recipe by you that I made. It is absolutely wonderful and the young men in the house are not complaining either. Thank you! Sorry, this is a five star recipe! What can you use to substitute the coconut with? Milk, evaporated milk, cream? Not sure as coco has a thickening ability most others do not have. I’m allergic unfortunately. This recipe has become one of my staples and newest favorite! LOVE LOVE LOVE it! Aw, thanks for the recipe love, Trish! You’re too sweet, Diana! It’s awesome to hear how much you enjoy my recipes. Thanks for the love!! Loved visiting your blog, Angela. It is such a pleasure reading your yummy dishes and try them out with my husband who is a retired army man. Tried your butternut sweet potato dish and I must say that he like it really well. Keep sharing dishes like this! All the best. Do you think this would be O.K. to make in the crockpot on low for a day? I think I would like to serve this at my house warming party, which will be on a Friday evening, so cooking the day of is probably not practical. Thanks! I’ve tried it and it worked in the slow cooker (although I can’t remember if I had to adjust the liquids…it wouldn’t have been much if I did). The only thing I would suggest is if you’re adding chard, to wait until adding it just before serving. I added mine at the start and I found the stew had a “chard-y” flavour after slow cooking, haha. My whole family LOVES the Oh She Glows cookbook; we have yet to buy the second one but Christmas is coming. This recipe is amazing; so delicious and family friendly. I don’t have an immersion blender, so I just put half in the blender and then added it back to the pot. I also served it over cauliflower rice delish! You rock, keep it coming. This is delicious. I made 2 minor changes. I was out of lentils so added a can of red kidney beans instead. Also, I used a can of Rotel tomatoes to give it a bit of a kick. This is so easy to make and super good. haha Marla, thank you for this entertaining review! I loved reading your thoughts on this stew. So glad you enjoyed it! I made this tonight and it is delicious! I can hardly wait for lunch tomorrow…if I can stay out of it tonight! Amazing ! Perfect comfort food for a cold day ! I love all your recipes! I made your panzanella for Thanksgiving (acorn instead of delicata squash, equally as yummy! ), and it was a HUGE HIT! I’m looking forward to making this stew also! I just noticed though that the printer-friendly version of the recipe is blank, or is covered by a menu, on right of page. It’s just so much easier to look at with only the ingredients and directions visible. Is there something I’m missing here? I’m sorry you’re having trouble with the printed version of this stew. That definitely shouldn’t be happening! Do you mind shooting an email to press[at]ohsheglows[dot]com with a screenshot of what you’re seeing, and which web browser you use? Thanks! I was wondering if this stew can be frozen and warmed up later? Absolutely! I find that most of my soups and stews freeze very well. You can freeze individual portions, flat, in zip freezer bags, or freeze in frezer-safe containers (leaving an inch or so for expansion). Hope this helps! Oh me. Oh my. This is DELICIOUS! I made this stew 5 days ago and have been eating it every night for dinner. I only added one sweet potato (all I had), extra squash, and extra red lentils. Took the route of pureeing some at the end of cooking. Also added a bit of mushroom stock in addition to the veggie stock for a little more depth of flavour. I am making a DOUBLE batch again today and plan on freezing some. Such an excellent, easy, scrumptious and healthful recipe – thank you Angela!! Hey Rose, SO great to hear you are such a fan!! Thanks for this awesome review. I’ll have to try it with mushroom stock. I cant get the recipes to print. Any ideas? Hey Vicki, I just checked and it’s working on my end. Do you mind sharing which web browser (and version) you’re using? Hopefully we can figure this issue out! Thanks Marianne! So happy it was a hit. Delicious! I used carrots instead of sweet potatoes and spinach for the greens. Angela, I have both of your cookbooks and have never made a recipe we didn’t like. Thanks! Hi Karen, Glad it was a hit! I love using carrots in this stew too. Thanks for your kind words about my recipes, by the way, so happy you enjoy them so much. I just made this for a vegan side for Thanksgiving tomorrow (we have vegans among our meat eaters in our family) and it is delicious. I’m trying not to eat it all tonight! I’m going to add the greens tomorrow before serving it, but it is really amazing. Great job! Hey Catharine, Oh the hardest part about make-ahead recipes is not eating them all before! So happy you love this one. Thanks for the feedback! Oh my GOD this is amazing!! I didn’t have apple cider vinegar, so I used red wine vinegar instead, but HOLY it’s so good! I swear the vinegar is the secret ingredient that adds that extra ‘oomph’ of flavour! Even my boyfriend, who LOVES meat, ate two bowls of this. Makes a HUGE amount, also, so I brought some to work for lunches and shared — and everyone at work wanted the recipe too! Thank you for this, will definitely add to my winter staples! Hey Allison, Whohoo…so thrilled to hear you all enjoyed it so much! Thanks so much for your feedback. I just made this tonight and cannot get over how good it is! Thank you for the wonderful recope. 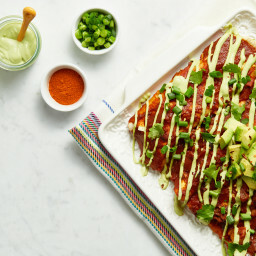 Now that I’ve tried it, I can’t wait to make it for guests – always looking for recipes to share that showcase how delicious vegan/plant based diets can be. Hey Masha, So happy you love it so much! Thank you for trying it out. :) I hope it’s a hit with your guests too. Thank you so much for this!!! tried it 3 times so far and hands down one of the best homemade stews ever made. Officially my go-to staple stew at home! This is really a great recipe! It was a super smart move to add the apple cider vinegar. The acidity gives it such a bright flavor, which is needed because of all the heavy elements. There is one thing though that I do to elevate it just a bit more. While the flavor is excellent, the texture is very mushy. And while you have a plethora of great ingredients in here, they get lost in the mush. Holding on to the chard stems, chopping them, and throwing them in along with the leaves gives the stew a little crunch and breaks up the monotony of the soft potatoes and squash. This recipe is truly awesome. It has risen above my two other make-all-the-time lentil recipes. I can hardly believe that such a few simple spices create this much flavor. I double the garlic & heat spices and use dino kale since it’s easier to come by. I always use full fat coconut milk–who doesn’t love extra creaminess in everything?! I add a pound of grass-fed ground beef to this (sorry, but it adds another level of flavor and richness that is incredible) and double the lentils so there’s more to enjoy for longer! Hey Sarah, So happy to hear you love this one so much! Good call on using the full-fat coconut milk! So rich and satisfying. I did a little experiment with this recipe by throwing all of these ingredients in a slow cooker for four hours because my little angel of a screaming toddler was not about to let mama chop, saute, and boil! Mistake! Apparently the acidity from the tomato and apple cider vinegar, along with the generous amount of salt I added kept the lentils from absorbing any liquid. Aaarg! Going to try and let it go overnight, crossing my fingers that all is yummy and mushy in the am. I also read that under-cooked lentils can be quite hazardous! Who knew… thought I would share my chemistry lesson here in hopes in helps someone else. Doh! Looking forward to trying this recipe AS WRITTEN next time! Hey Tiffany! I hope it worked itself out overnight too! Just checking: did you use red lentils? They cook a lot faster than regular brown or green. I made this today, it was amazing. Usually the only thing I have had from this site has been the holiday soup for the soul and that was great so I had high hopes. I did edit the recipe a bit with extra butternut squash, no sweet potato and double the lentils but it was pretty much the same thing. Blending some of the veg at the end really works well, and it was tempting to just have that as an amazing soup. I had never used cider vinegar before this so bought some today, star of the show! Had it with Cauliflower rice and it was sublime, thanks! Hey Paul, I’m so happy to hear both the recipes you’ve tried so far have been hits. Thanks so much for your feedback on this recipe! It’s always so nice when you can customize a recipe with what you have on hand. Happy cooking! This looks a great recipe and cannot wait to try it. I’m just wondering how many people it will feed? Need to feed 4 hungry adults and a 1 year old. Thanks. Hi Helen, The yield is 11 cups (2.75 quarts)…hope this helps! Yummm! Made this tonight!!! Added white beans along with spinach and squeezed lemon juice on it at the end. I can not wait to eat leftovers tomorrow!!!! Thank you! This is a new favorite. Super easy and so tasty. just made this tonight—with plenty of leftovers. thank goodness for that! i live on my own and can see this stew being gone before wednesday. at least i have plenty of ingredients remaining to make another batch!!!!! haha Maggie, I can feel your excitement for this stew…thank you!! I hate sharing stew and soup too. lol. It just goes too fast. The leftovers get better and better too. I accidentally doubled the cumin, turmeric and chili powder. I thought the spoon I was using was a 1/2 tsp., but it was actually 1 tsp. Oops!! As it turns out, it was a great mistake to make!! My 12 year old steppy who “doesn’t like squash” LOVED it! Thanks for sharing this recipe, I look forward to perusing more of your posts!! Fantastic recipe and I’m curious to know if it can be made in an Instant Pot. As a recent Instant Pot convert, I’m looking to try as many recipes as I can in it. This one looks like it would be a winner. I know you gave directions for the slow cooker and I’d like to use the pressure cooker function. Thanks in advance for any directions and thanks for so many of your other excellent recipes as well. Hey Judith, I haven’t used an Instant Pot before so I’m not sure, but maybe another reader can weigh in? I actually made this tonight in the Instant Pot! I used to the saute function to soften the veggies and left it on saute as I put in all the other ingredients. Then I set the pressure cooker button for 10 minutes. I didn’t add the apple cider vinegar and chard until it was done cooking. Worked well and was delicious!! Thanks for sharing your tip about the Instant Pot!! Love it. Honestly this is such a delicious, warm, hearty stew great for those cold winter nights! In love! Great receipe, you have really nailed this one. But then again, I have tried many of your receipes from your books, and they are very tasty. Nice job. I cut down the liquid to two cups in order to make a slightly thicker stew and it works great. Thanks! Hey Gary, Thanks so much for your review..I’m so happy you’ve enjoyed so many recipes. And thank you for all your support with my books…means a lot to me! Really looking forward to trying this recipe later today! Do you happen to know the nutrition facts for the recipe? Hey there, The recipes I share are original recipes unless otherwise indicated. So in this recipe, I’ve mentioned that it was inspired by a recipe from Deliciously Ella. Hope this helps! Hey Rachel, Thank you so much for sharing your recipe tweaks! That’s awesome you love it so much. Thank you for trying it out! I like everything I’ve ever mad from the OSG books and APP but this blew my mind!!!! It was so flavourful, filling and satisfying. Will be making this often!! Thanks for always giving us the most tasty recipes – oh ya and it’s husband approved (by a non-veg/vegan)! Hey Lisa, Oh I’m so happy you loved it! I made it this weekend too and I had forgotten how much I love it. I already bought more squash for my next batch. Hi there, this sounds absolutely delicious. I have to try and adapt a week’s worth of meals to a lady who is allergic to the deadly nightshade family.. so no tomatoes. Have you ever tried making this without the tomatoes? Hey Georgie, I’m sorry I haven’t made it without the canned tomatoes, but I’m planning on making it again tonight so I will try to remember to try it! I’ll add the tomatoes near the end and compare the two. I’m testing it right now and just wanted to update you! I tasted the stew half way through cooking without the canned tomatoes and the tomato paste and it’s quite good! I do think you can get away without using them, however since there’s no acid from the tomatoes I think it’s especially important to use the apple cider vinegar at the end of cooking, and you may even want to use a bit more (adding to taste). I’d love to hear how it goes if you try it out! brilliant.. I will try it out and let you know . thanks so much for getting back to me . I’m new to plant based eating and am trying this recipe for the second time – no tomatoes first time except 1 measly Roma tomato! It was so good. I’m following the recipe exactly and my kitchen smells wonderful. I especially like the “dice small, about the size of almonds”; I use this all the time! Love your app, insta-stories and website – it’s making this lifestyle/eating change easier. Thanks Angela! Aww Colleen, I can’t thank you enough for your encouragement and support! :) And Im so glad this stew worked for you without tomatoes…I tried it this week and was pleasantly surprised myself. I’m so happy I stumbled upon this recipe! I made it for dinner last night, and it’s definitely a keeper! It’s so flavorful and filled with healthy ingredients. I sautéed the veggies in water and reduced the recipe by 1/2 teaspoon of salt. Everyone loved it! I just had a sweet potato with this stew over the top for lunch. I’m so happy there are leftovers! Hey Renee! Cozy must’ve been in the air last night as my mom made it for us too…one of my faves! Thanks for trying it :) I love that you served it over a sweet potato! And great that Colleen has also tried it without tomatoes..
i need to make it for 13 plus people. the recipe is for 11 cups. I am not very good at quarts.. being english I am a little unused to this measurement.. Any tips greatly received. I think you’d probably want to double the recipe if you are making it for 13 people. I think this recipe would serve 6 (at just under 2 cups/500 mL per person). Doubling soups can be a bit tricky as sometimes you don’t need to double the liquid fully, and sometimes you need less salt too, so my advice would be to add the liquid and salt slowly as it cooks, to taste. Thank you for the deliciousness! I made this and it was so good! I love your cookbook and stumbled across this recipe online. The spice combination is awesome and I added a bell pepper as well. Served with rice and warm naan perfect supper. Hey Annie, Woohoo so glad this was a hit! I make it almost weekly lately! This cold weather just doesn’t want to leave. OMG, instant new favorite! As I was making this it kind of reminded me of the Glowing Spiced Lentil Soup (another favorite), so I threw in some cinnamon and cardamom almost by habit. It was so freaking delicious that I literally dreamed about it last night and this morning my husband and I fought over who gets to have the leftovers for lunch (I won, moahahah). Fabulous recipe! Truly delicious. Thanks Angela. Angela, Delicious! I wonder, but a lot of calories? How would you modify this for a slow cooker? Hey Jessica, I would saute the onion/garlic/spices in a saute pan first, and then add it along with all the ingredient (except for the greens) and cook on low for about 8 hours. I would add the greens during the last 30 minutes probably. I haven’t tried this before but I can’t see why it wouldn’t work. I hope this helps! Aww thank you Ann! I’d have to agree with you…whenever I make it I always say that I forgot it tasted this good! haha. Thanks for another great recipe, Angela! We have been eating more plant-based meals over the past year and your blog has become a go-to site for me :) It’s better than sifting through Pinterest! I omitted the tomato paste, chard, and ACV because I didn’t have the first two and forgot the last one, but it was great nonetheless! Wonderful for a rainy, cool fall day. Hey Kelly, I’m so glad you’ve been enjoying my recipes! Thank you for the kind words. :) And that’s great news that the stew stilled turned out without those ingredients…I love when a recipe is versatile like that. I made this on our camping trip– previously measured everything out, so all I had to do was add to the pot and let it cook over the campfire. I doubled the red lentils, and did not blend, so it ended up being a thick(er) stew. I also did not serve with rice or toppings. It was the perfect meal while we all sat around the campfire :) THANK YOU! I LOVE THIS!!! How cozy does this campfire stew sound? So perfect…thanks for sharing Jessica! Tried the recipe. Delicious! I added less cumin and no cayenne pepper, so it is on the sweeter side. But to be honest – it is perfect for cold autumn nights at home. Thank you! Will make again! Where do I find your cookbooks ? Hey Tina, That’s great news you loved the stew so much! Good idea on changing it up with some black rice…yum! I just made this for my family and they loved it. I made it in my Instant Pot (6min Manual then 10 min natural release) to shorten the cook time. So delish! I will definitely make this again. Thank you! Thanks for sharing you IP method! I can’t wait to make it in mine. Love this stew! But skip the salt, it doesn’t need it and it will be better for you. Thank you for the wonderful recipe. I have the Oh She Glows cookbook and I highly recommend that as well. Thank you so much for your support LeAnn! Thanks so so much for this very comforting stew. Made it tonight and we all LOVED it! I used kale in place of the chard and didn’t add the sweet potato as I didn’t have one just more lentils and squash and all still turned out divine! Wow, this was fantastic. I’m relatively new to cooking and a slow chopper, so it took me about an hour and a half to make this stew. Despite the time commitment, it was well worth it. My eyes almost popped out of my head when I first tried it. The flavors blend together beautifully; the texture is divine. I will definitely be making this again for my family. Maybe next time, I’ll buy a bag of pre-cut squash instead. well Im so glad you stuck with it and it was well worth the effort! :) So happy to hear how much you love it. This stew is delicious. I even received a positive “it’s not awful” comment from my picky child. (That’s a win in my family!) I’ll be adding this recipe to the fall/winter dinner rotation. haha oh I can relate to those comments ;) So glad it was a hit! This is a great hearty recipe. Totally cozy and perfect for a (holiday) meal that you want to eat over the course of a few days. I doubled the recipe, added more greens to the pot at the end, and served basmati rice on the side. Delish! I think next time I make it I’ll add more green veggies and see how it turns out. I love this stew! I have made this recipe about a half dozen times and a two of the times my lentils lost their skin and turned the stew a dark brown color. The flavor was still great but the color was very unappealing. Any ideas as to why this could have happened and tips to avoid this from happening in the future? thank you! Hey Melissa, Hmm it sounds like you may be using green or brown lentils instead of red lentils? Generally red lentils don’t have lose skins (they more so just break down when cooked). I’m so glad you love the stew regardless! It’s a fave over here. There is something wrong with your website. This page says there are should be 409 “comments” for this post over 7 pages, but I can only see the comments on page 1. When I click to see pages 2,3,4,5, and 6, I can see the number of comments that should be on the page, but none are actually shown. I found that this is not just an issue with this recipe… I had the same problem with your Red Lentil recipe. Please help. We loved this!! We were looking for a way to introduce Indian food (and Turmeric) into our diet without going ‘all in’. This is a beautiful, colorful, hearty dish. My husband would like more protein so he suggested adding more lentils or other beans (or smoked turkey sausage, which would defeat the vegetarian aspect!). It was a joy to watch and smell this stew coming together! Do you think it would be possible to make this in a crockpot? Hi I just made this and I’m wondering if you can freeze the leftovers? Hi! Looks super yummy. If I would like to make this in a slow cooker, what would you suggest? This was really lovely! I appreciate the curry feel with the nutritional benefits of all those healthy veggies. For the most part I followed the recipe exactly and it came out great. My supermarket didn’t have red lentils so I used green- next time I think I would double the amount (or try the red and see if it’s different). I also added a can of chickpeas in addition to the lentils and enjoyed it. I was a bit heavy handed with the spices and regret it because it’s a little too hot for me now- heed her spice warning! I made this recipe for the first time when we had my brothers over and everyone gobbled it up! I made it again -doubled this time and sent to my mom who was sick with a cold and she said it was exactly what she needed👌🏻 The we had my husbands friend over and pulled this out of the fridge – he had seconds! so my double recipe was put to good use:) Made another double recipe this week and it’s been the perfect winter food to have around. Thanks Angela! I love reading your story of the traveling soup!! Hah. So sweet you share it with so many. Thanks Hadassa! So good! I subbed a Tbsp of mild curry powder for the spices (still added the salt and pepper) and spinach as the green. I was so excited to eat it, I almost forgot the spinach! I also used a potato masher to smash up the sweet potato and squash a bit to thicken. Since making this for my daughter’s birthday, it has been my new favorite recipe. Love the fragrance as it cooks and the taste over basmati rice is soooo delicious. I LOVE this stew. I used paprika instead of cayenne and also added chili flakes to add a nice oompf. I added a bay leaf when simmering to amp up flavour and it was amazing. I love this. Next post: Oh She Glows 15 Best Vegan Cookie Recipes!